In a few short years, On Demand Business has gone from a simple concept to an undeniable reality, and for good reason. It works for everyone: consumers, businesses, and governments. 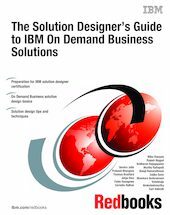 This IBM Redbooks publication addresses the topic of designing the On Demand Business solutions that have become so central to our clients' business success. It is intended to be a resource – but not a prerequisite - for the technical professional who is preparing to take Test 817, IBM Certified for On Demand Business - Solution Designer. This publication offers sample test questions for Test 817. The information provided is designed to help the reader prepare for the test, including helpful tips for taking it. Beyond being a reference for Test 817, this book will be helpful to understand the IBM On Demand Business strategy and to design solutions that support it. The book helps you design On Demand Business solutions using proven methodologies and patterns, explains key On Demand Business concepts and technologies, describes what the On Demand Business solution design process entails, and shares experiences that others have had designing On Demand Business solutions. It also provides information about resources and tools related to On Demand Business solution design.